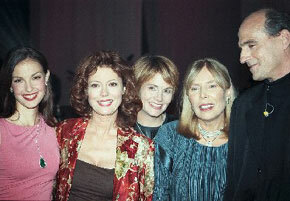 In fitting tribute to Joni Mitchell, the TNT network, brainchild of media-mogul Ted Turner, presented an all-star celebration at the Hammerstein Ballroom in New York City, April 6, 2000, hosted by Ashley Judd. Attempting to homogenize the sounds of the Canadian singer-songwriter, the all-star tribute had something for everyone from the well intentioned to the misguided. For prime-time purposes, I suppose, Mitchell's fierce and singular songs were unfortunately turned into, well, middle-of-the-road niceties. Joni Mitchell is a unique artist having shunned her initial success as a confessional spokesperson of the sixties counter-culture bra-burning set in pursuit of artistic nirvana as a latter day jazz/rock diva. From the downright shlocky to the dynamic, all phases of Mitchell's career were covered with a concentration on her earlier (and finer) works. Opening the performance, Wynonna Judd and Bryan Adams offered a "clean" rendition of "Raised on Robbery" in vien of, say, today's Disney-fied Broadway. Cyndi Lauper, the pink haired, fun lovin', zany cretin who hails from my alma mater in Queens, Richmond Hill High School, sang "Carey" with a vocal style that soared and added a campy edginess to an otherwise mellow event. According to the press kit, Stone Temple Pilots were originally slated to perform "Woodstock," however, Richard Thompson of Fairport Convention fame stepped in with a stripped down acoustic rendering that was stark naked, bare and unpretentious. He also performed "Black Crow," one of Mitchell's lesser known works that rocked the house and jangled the diamond-studded earrings off the well-endowed crowd in attendance including Michael Bolton, Susan Sarandan, Lawrence Fishborne, among others. James Taylor offered up a somber version of "River" while Elton John transformed "Free Man in Paris" into "Honky Cat" with its barrelhouse-blues tone. Sweet Honey in the Rock turned "Circle Game" into a gospel-infused blur with doo-wop harmonies and some rather offbeat attempts at African rhythms. They say k.d. lang performed "Help Me," but from the cheap seats where the press was hidden from the tuxedoed, I couldn't really tell. A couple of the celebration's finer points included Diana Kroll offering up the splendid "A Case of You" that was moving and downright tearful, and the woman of honor herself, Joni Mitchell, who ended the evening with a 70-piece orchestra backing her up on "Both Sides Now." Singing with the style and maturity of old-time blues/jazz greats like Billie Holiday and Ella Fitzgerald, Joni inflected, reflected and turned the song's insightful drama into the evening's showcase, finally loosening the somewhat stiff made-for-TV taping into a smokey-torched cabaret. The all-star tribute to Joni Mitchell aired on TNT, Sunday, April 16th, 9 p.m. This article has been viewed 8,414 times since being added on December 30, 2001.